MPC Social Services opened its first soup kitchen in November 1991, at a time when over half of Moscow’s residents lived below the poverty line. 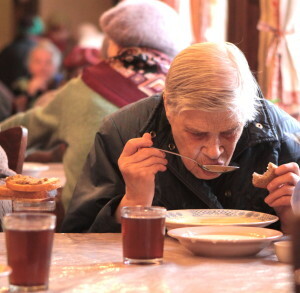 Since then, we have served over two million meals to elderly Russian pensioners. Many people have come to the soup kitchen regularly for more than five years, and several have been with us for more than ten years. The new program began in September 2014. We operate at St. Andrew’s Anglican Church every Wednesday from 11:00 AM to 1:00 PM. If you are interested in attending or volunteering, please contact Development Director Imanni Burg at development@mpcss.org. We are hoping for some Russian-speaking volunteers who can chat with the pensioners, but please don’t worry about your language skills. A warm smile is the only requirement! Volunteers should arrive at 9:30 or 10:00 on Wednesdays before the clients arrive. If you are interested in sponsoring the program financially or donating food, please contact Imanni Burg at development@mpcss.org. 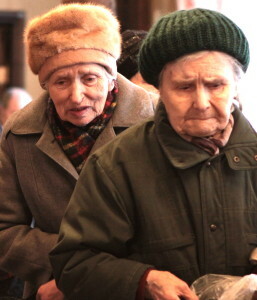 A donation of 20,000 RUB would provide food for 120 pensioners for one week. We have listed some specific donation needs below, but we welcome any ideas you have.